Experience truly is the best teacher. When it comes to turning your artwork into real world, tangible objects, unexpected challenges often arise. Those challenges mean you have to truly understand (as best you can) the hows and why things work or why they fail. My Adobe Illustrator training has spanned so many facets because the program is used by so many graphic arts, etc. The old adage, “jack of all trades, master of none” comes to mind. If you really want to hone your skills in a particular field, you have to first understand the generalities and work your way down to the nitty gritty. In this case, I was challenged to do something relatively simple: create interesting spiral shapes within a fixed dimension (approximately 73″ x 67″). 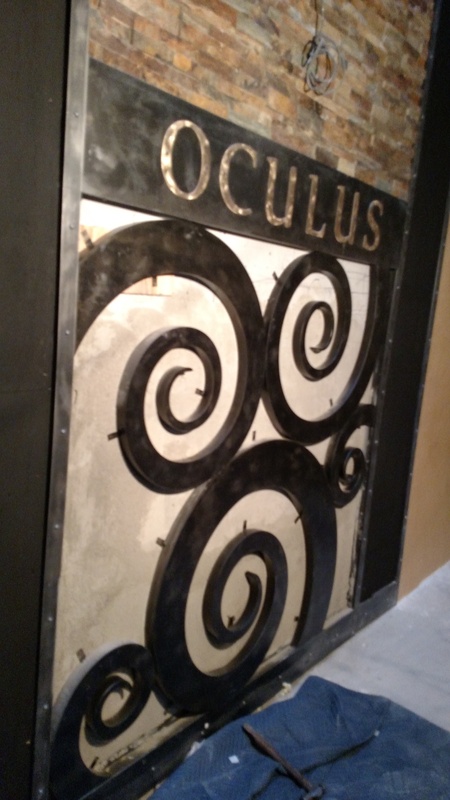 The shapes would have to be cut out by a CNC plasma cutting machine, boxed in (3 dimensional), tacked and welded to be fastened to a hardy backer wall. Within the spirals would be river rocks. Simple enough, right? Well..not exactly. Most CNC machines (water jet cutters or plasma) require DXF files (Drawing Exchange Format) files, used with the industry-standard AutoCad programs. Illustrator, it turns out, doesn’t export DXF files very well. Well, I should qualify that statement by saying that they are just two different animals, used primarily for two different purposes. DXF files like lines, not fills, bounding boxes, etc. Well, we finally got them cut. 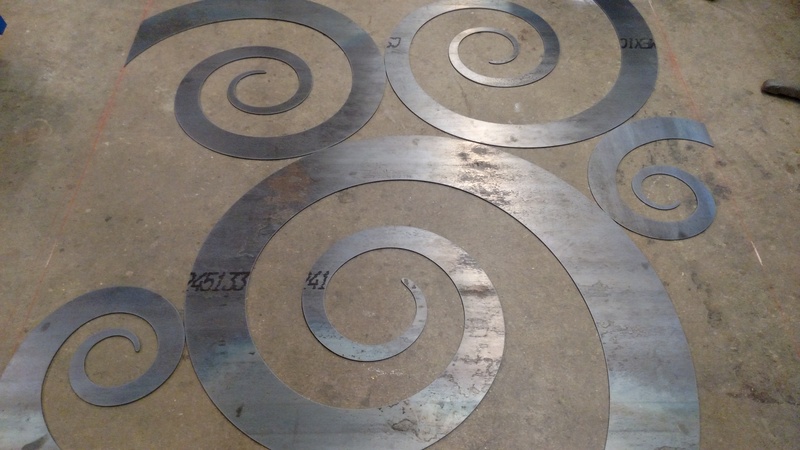 Steel spirals cut from a CNC plasma cutting machine. Thank you GFC Precision! Very cool to see what you’ve created on your computer screen translated into a tangible result! 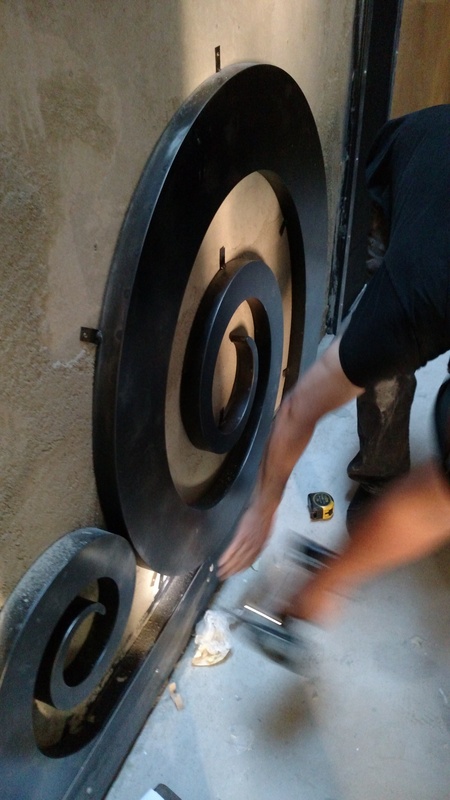 So, after boxing the spirals in, applying a patina, and clear coating, it was time to install them. So, this is the as yet unfinished project (final photos to come). So, I have whetted my appetite by using the skills that I have learned in a real world fashion. Not without its complications, but bring on the complications! I have learned so much and will continue to learn.